Random fact: I can’t leave my apartment without this Moleskin sketch book. 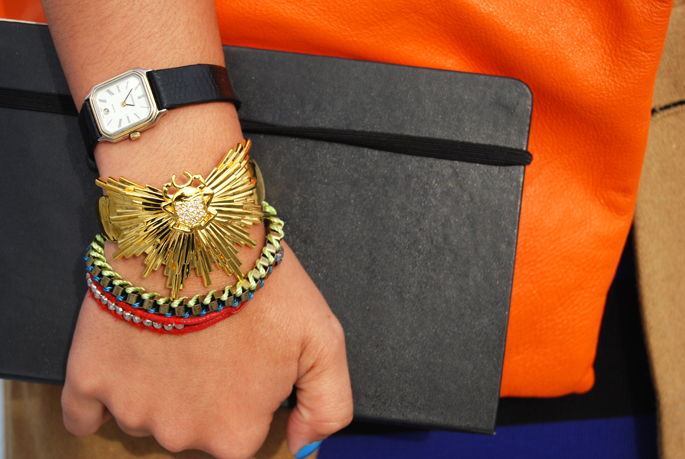 Perfect for writing notes on the go, plus adds structure and shape to an otherwise floppy clutch. Not sure what I thought of double stripes – but they actually look really good on you. i love the nail polish! what brand/color is it? I LOOOVE this skirt, crazy that it is Forever21! I love the combinations you come up with, always so unique but so you, and so gorgeous! how do you do it?! you are fearless, my friend! i mean, this looks so good. SO good. Love this look! Brilliant move separating the graphics with some neutral and a bold shot of color! You look smashing dahling and ohsochic! this outfit KILLS it. youve got such a great eye! fantastic. I want your legs. K thanks. You must have a neverending closet of fantastic. You always are so stylin' and I haven't noticed repeats…. Each look is pretty unique too! I adore your outfit. I'm not sure if I can pull it off but you look amazing. And I love the clutch. this is an amazing outfit. last night i saw a woman wearing double stripes as well, but it just didn't work like this does! and the orange bag just makes it. What a great outfit..I love the double stripes and the pop of color from your bag. just found your blog, and i love it! i'm your newest follower. ps. come check out my 30 for 30 remix ! hello! great blog 😉 I like so much your outfits!! Such an extraordinary stripe on stripe ensemble! And you look beautiful in all those candy colors! OH la la the stripes are perfection on you!